Discover a bustling Old City that traverses centuries of history and culture as you pop into little-known restaurants, shop at handmade artisan shops, and delve into bakeries located in basements of ancient buildings. Attention urban hikers and explorers! If you love climbing to grab a bird’s eye view of the urban sprawl below or if you relish hiding away into deep recesses of ancient alleyways, then we’ve got an exciting tour for you! Taste the flavors and traditions of Jerusalem’s ancient Old City in this unique experiential culinary tour where spices and sweets blend with history and culture. From sights to sounds and tastes to touch, this all-senses Old City Tour will heighten your appreciation for the peoples and histories in this bustling, ancient area. Our Jewish Quarter Tour brings these ancient streets and scenes to life, through an experiential tour covering centuries of Jewish and Israeli historical figures and moments. Visit the final 14 stations where Jesus walked - nine on the ancient Old City streets, and five in the Church of the Holy Sepulchre - on our Via Dolorosa and Christian Quarter walking tour. Dating back to the Roman period, the Temple Mount has played host to everyone from Ancient Israelites to conquering Romans, and from 10th century Arab Caliphs Umayyad to 20th century British archeologists. And now it’s your turn. Drawing from the best known figures and legends of the Bible, visit the most significant sites in Jewish history and follow in the footsteps of Ancient Israelites as they made their way back to Jerusalem today. 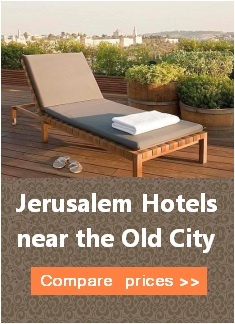 Planning a trip to the Old City of Jerusalem? It’s hard to imagine a trip to Jerusalem without visiting the Old City. It’s here, in the narrow ancient alleyways that the real Jerusalem can be found: that special blend of old and new, where history and fairytale clash amid cultures and traditions born centuries ago. The Old City is home to an amazing array of places and sites to see: the Western Wall, the Temple Mount, the Dome of the Rock, the Church of the Holy Sepulchre, the Jewish Quarter, Muslim Quarter, Armenian Quarter.. and the list goes on. So what are you waiting for? Are you looking for an experiential tour that isn’t just another boring, passive walk through of old ruins? Need help arranging a great tour for yourself, family or friends? Different ages? Different religions? We’re here to help! Contact us with details or general questions and we’ll customize an Old City experience that’ll you’ll never forget. Get started here today. We’re looking forward to welcoming you.